If you are looking for the best in photography for your special occasion, contact Handy Photo Media. Emmett and Stephanie Handy bring more than 20 years of media design and imaging to their business. They pride themselves in superior customer service and satisfaction. Contact them on the web at www.handyphotomedia.com. 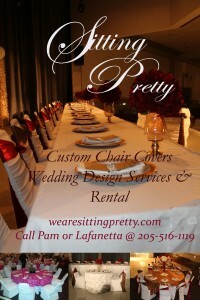 Sitting Pretty is a linen rental company specializing in unique chair linens for weddings, receptions, and banquets. All of the Chair Linens provided by Sitting Pretty are custom measured and ordered to fit each class of chair within your venue. They carry an endless catalog of bands and sashes with a color perfectly suited for your special day. They are your exclusive rental company for the latest fashions in specialty Wedding and event linens. Your guest will leave your special day with an experience unmatched by any other. Visit WeAreSittingPretty.com for more details. PRIDE PHOTOGRAPHY is a family owned business. Their goal is to provide the best in customer service and affordable prices. Contact them on the web at www.rpridephoto.com.